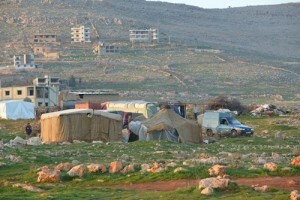 ACN photo: Muslim Syrian refugees have set up camp in the village of Kaa. As refugees are welcomed into neighboring Middle East countries Democrat senators want to make sure abortion in available funded by US taxpayers. Senator Richard Blumenthal drafted a letter to President Obama signed by 27 of his Democrat colleagues asking that the longstanding Helms amendment be gutted. Current law prohibits any US foreign aid be used for abortion. Millions of men, women and children are fleeing conflict regions in Iraq and Syria — countries where abortion is restricted. Recognizing that refugees are heading to US foreign aid recipient countries where abortion is legal – like Turkey, Lebanon, Jordan and Egypt – these lawmakers want US funded abortion waiting for them. The letter asks President Obama to “issue guidance to the relevant agencies” in order to circumvent the 40 year abortion funding prohibition. While an Executive Order by the president is not expected the same result can be accomplished quietly through grant awards issued through the State department and USAID with little transparency. Abortion groups and Democrat lawmakers have exploited the terrible situation of sexual violence in war-torn regions to open the financial floodgates of humanitarian aid – billions of dollars to overseas abortion clinics. Democrat senators signing the letter are recipients of campaign funding by abortion groups. Rescinding the Helms amendment is a top issue for global abortion groups and pressure has increased to secure this policy change before President Obama leaves office. Refugees seeking safe haven are not looking for donor countries to supply abortion — rather shelter, food and healthcare is what they desperately need.